I just wanted to share with my FF family that MP John DeCollibus has a class starting October 17,2017. Deadline to signup is on Friday the 13th. I would love everyone to create a pangram with your name, city, or trait to share. I prefer to practice writing them, so it would be nice to have some that reminded me of my calligraphy friends and FF family. I will compile a list of the creative original pangrams that we make. I will create a list here and add posted ones. I am still working on one from me, but I came up with one for the FF. You can always write yours in ink too. FYI: A Pangram is a sentence using every letter of a given alphabet at least once, e.g. The quick brown fox jumps over the lazy dog. Hello, my niece Cora Elizabeth was in a horse accident over the weekend. She is a rodeo queen in Tennessee and her horse sat down and rolled over her. She is recovering from hip fractures, but will need a lot of physical therapy and rest. She came with me to IAMPETH 2015 packet pickup, so some of you have met her. Cora is the nicest, caring and most wonderful 18 year-old I have the pleasure of being related to. I haven't been blessed with kids, but my nieces and nephews have my heart. If you could practice her favorite song lyrics, or maybe her name and send it to her, I would really appreciate it. I think a mail box full of calligraphy would be wonderful. I know I will be sending my love. Please message me for her address. And blooms in the dead of the night..."
Open Flourish | General Discussion / What do you think of the IG group Calligraphy Masters? I just had a quick poll and if you want to add discussion about the Instagram "Calligraphy Masters". I would love to know more information about it, if you cared to share. The reason being was something a guild member brought up at meeting. She said, wow it looks like everyone is calling themselves masters these days. I guess I didn't understand, but she said the calligraphy masters hashtag. I guess I notice it a lot more on Instagram. Their name is not Master calligraphers, which would be a real tough subject. The website has this mission statement for the group "Calligraphy Masters is a community of calligraphy artists and calligraphers passionate about the world of letters. We're all united in a mission to re-establish Calligraphy as a leading art and share the inspiration and experience of creativity together. We believe that everyone can become a master of their own calligraphy." Re-establish Calligraphy? Was it bad before or something? Please discuss. I am going to begin a calligraphy/lettering club at my high school I work at in the next few weeks (Mid-Febuary). It's a poverty level school in a really bad area of Chicago. So my students will not have money to buy the calligraphy/lettering related supplies and ink. I was hoping for any old/gently used items that could help us out. I will keep most supplies at the school, but will give students items to take with them to practice at home. Club objective: teach pointed pen, broad pen and pointed brush calligraphy, handwriting, cursive, and basic lettering to as many 9-12th grade students as I can. Goal: Students will create a lettering piece for a end-of-the-year show and publication. If you would like to help, please PM for my address. I understand that shipping can get costly, but you would be helping out some really great kids that deserve to learn this beautiful art/craft! I will also post photos here too of their work. Coffee & Nib-bles / What did you do with your time before you began to practice calligraphy? My hubs and I were talking about what we did before we got our dog and then, for me, before calligraphy. I guess I gave up on watching TV and reading novels. I do miss reading novels, but it just takes me a little longer to read a whole book now in between my calligraphy and lettering practice. What did you completely give up, or maybe just cut down with your beginning of your calligraphy practice? I dug out my D.T. Ames book and found some great drills to help with whole-arm movement, flourishing and off-hand flourishing. The online book is located on the IAMPETH rare books site http://www.iampeth.com/ames-guide-self-instruction-practical-and-artistic-penmanship. I attached a few pages of the drills I am focusing on. I dated my practice sheets and I hope to see some progress. I am on day two, and I feel a lot more confident on some one them. I wanted to share for people in need of new drill exercises. May the ovals be with you. "In this 4 week class we will cover everything you need to know to create beautiful illuminated initials. They make perfect gifts for the upcoming holiday season! Step by step we will study Lombardic initials, add ribbon details wrapping the initial, draw and transfer our patterns, learn how to make color decisions, gilding, floating shell gold, painting techniques, and add a background pattern or design element. For our inspiration we will be using a beautiful 16th century Lombardic alphabet that has ribbons and florals. You are free to use a diaper pattern background if you choose. For beginning students, you will be able to use a pre-drawn initial if you are not comfortable creating your own. For the more advanced students- the more creative the better! Design away. We will discuss all of this the first week. The class will be 4 weeks, posted by 5:00 pm EST on Wednesday, September 9, 16, 23, & 30, 2015. The class will remain posted through the second week of October should any one need to make up a date." I love taking classes with Harvest. She is a great teacher. Her forum is a great place to be during her classes because you get to see other peoples homework too. I plan on taking it and I hope to see people from FF there too. I just found and printed off some guide sheets from IAMPETH. I just thought I would share. Open Flourish | General Discussion / Please Share: what thread was the most helpful to you? 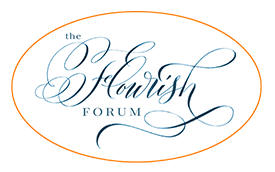 I would like this thread to be about the most important thing you have learned from the Flourish Forum threads. Everyone has joined separately and at different times, so it would be nice to know what areas, or topics you liked the most. It could also be a thread that helped you with your practice. An "ahh ha" this is totally amazing! Today marks the 38th anniversary of National Handwriting Day here in the States. "The Writing Instrument Manufacturers Association planned the national day in conjunction with John Hancock’s birthday, because Hancock was the first to sign the Declaration of Independence with his renowned signature." It's in the news too. We should change in to Happy International Handwriting Day! I am noticing a difference in my Old World iron gall, from my McCaffertys iron gall. Basically it is way more acidic. My Zebra G's and Prince Lenny's (Principals) are dropping like flies after two days. John gave me a hint to wash it thoroughly before sending it to rest for the night with windex. That didn't seem to help. Has anyone had this happen? Do you know the least acid of the iron gall brands? I read on Schin's blog about Walkers, but it's across the Atlantic, so I guess I could try that out. I have sent quite a few envelopes this year, and notice that they always get dirt and damaged. So I purchased some Clear Plastic Envelope Bags, A7 (7 7/16" x 5 1/4") - 100 Envelope Bags for my Spencerian Class Letter Exchange. I sent 13 and had none of them returned. I think one that made it to CA was ripped. For my holiday cards I wanted to use the clear envelopes again. I spent a lot of time on each envelope, so I would send out 10 at a time. I used an outside postage pickup box. Everything was going good, until three domestic address came back with the stamp stolen and black marker saying to add postage. I posted this problem on the forum here and Michael said to use super glue and maybe that would help the thievery. It seemed to help, but you could still possibly take off the stamp, but it couldn't be used again. One made it to Germany, but the plastic envelope was gone with the postage (I am glad they didn't return in to the US). Another plastic envelope going to WA in the US was stolen, then returned to me with very large marker writing saying postage due. I will probably use them again. I was thinking they would be great for craft shows, samples and presents. They were $0.09 each, so very cheap for the job well done. Letter-size mail pieces are considered non-machinable and subject to a non-machinable surcharge if they are polybagged, polywrapped, or enclosed in any plastic material. This does not apply to bulk mailers or flats. Letters that meet one or more of the nonmachinable characteristics in DMM 101.1.2 are subject to a $0.21 nonmachinable surcharge per piece. Someone gave me this link to help with creating guidelines for Spencerian and Copperplate too.